ST. PETERSBURG, Fla. Tampa Bay Rays third baseman Evan Longori has agreed to a new contract through 2022 that adds six guaranteed seasons and $100 million. The agreement announced Monday with the three-time All-Star incorporates the remainder of the 27-year-old's existing contract, which called for him to earn $36.6 million over the next four seasons. The new deal includes a team option for 2023. "We drafted Evan in 2006 with the belief that he and the organization would grow with each other and together accomplish great things," Rays principal owner Stuart Sternberg said in a statement. 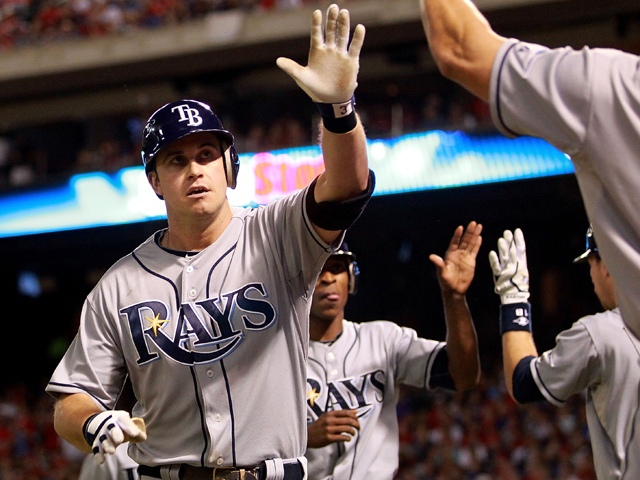 "That is why the Rays and Evan signed a long-term contract in 2008, and it is why we are extending our commitments. Evan has clearly become a cornerstone player and a fixture in our organization. We are proud of what we have accomplished these past seven years, and I expect the best is yet to come." Just six games into his major league career, Longoria agreed in April 2008 to a $17.5 million, six-year contract that included club options potentially making the deal worth $44 million over nine seasons. "Evan has all of the attributes we seek in a player," Rays executive vice president of baseball operations Andrew Friedman said. "His determination and work ethic inspire others around him. He is devoted to his craft and strives to improve himself every year, and he defines success in terms of team performance and achievement. It's exciting to know that Evan will be manning third base for the Rays for many years to come." Tampa Bay selected Longoria as the third overall pick in the 2006 amateur draft, making him the first player drafted under Sternberg and Friedman. The Rays were 47-27 when Longoria started and 43-45 when he didn't, CBSSports.com's Matt Snyder notes. "This is still a pretty good deal for the Rays," Snyder notes. "Adding the two contracts together comes to $144 million over the course of 15 seasons -- not to mention that Longoria will continue to be the face of the franchise." The two-time AL Gold Glove winner and 2008 AL Rookie of the Year ranks second on the Rays career list with 130 home runs, third with 456 RBIs and fourth with 161 doubles. Longoria is one of 11 active players to average at least 25 homers and 90 RBIs during his first five seasons. Longoria will donate more than $1 million during the contract to the Rays Baseball Foundation, the team's charitable foundation.